Las Vegas, NV – Las Vegas WET, LLC, a company formed to create a massive complex including not only an indoor ski and snowboard resort, but also two hotels, an arena, surfing, performing arts center, retail, restaurants, and the largest indoor waterpark in North America in the southern Nevada desert, made an offer to acquire over 200 acres of land along Las Vegas Boulevard late last month. 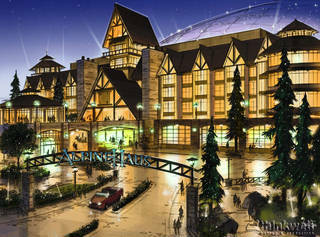 An artist’s rendering of Las Vegas WET, an indoor skiing, water park, hotel and entertainment complex proposed for the Nevada vacation destination. The founders are reportedly close to closing a deal on over 200 acres of land in the southern Nevada city. “We have exchanged a few counter offers over the past few weeks, and we are certain that we’re very close to a workable agreement,” said Kelly Jo Horton, co-founder of Las Vegas WET. While the exact location remains secret, it is known that the only area where that much land can be assembled is on the South Strip, south of the 215. The Company declined to identify the sellers and the precise location due to confidentiality terms in the offer. “We had originally planned to build on a completely different piece of property, but we had to look elsewhere when it became clear that the property we originally wanted was not big enough to allow for expansion,” said Horton. The Las Vegas WET team immediately began looking at other parcels, and started negotiations on the current property late last year. “This little hiccup is definitely going to delay our break-ground-date by a few months,” said Horton. The team had planned to break ground this spring, but the date will now be pushed until they can complete their due diligence on the new piece of property. While the Company’s website depicts multiple attractions, Horton indicated that there will be far more than meets the eye. “We increased our land requirements based on the need for additional space required by components we have yet to announce,” Horton said. The indoor portion of the waterpark alone has now been reconfigured to be over 350,000 square feet, making it the largest indoor waterpark in North America. The team has also decided to expand the environmental angle of the project, and will only be using electric and hydrogen powered vehicles at the complex, as well as expanding its water recycling and processing facilities. When asked to provide more details on the current layout of the park, Horton was very hush-hush, indicating negotiations with various partners were still underway and couldn’t yet be announced. “We have named the park, and will announce the name after all trademark and copyright searches and registrations have been completed,” said Horton. The 200-plus acres being acquired by Las Vegas WET is slightly larger than all of the Disneyland Resort in Anaheim, Calif., including both theme parks, all the hotels, retail, and parking combined.